November 26, 2018 By Lori 4 Comments THIS POST MAY CONTAIN AFFILIATE LINKS. PLEASE READ MY DISCLOSURE HERE. Part of my Christmas Cookie Series, this cookie is one of my family’s favorites. The recipe is a classic from Land O’ Lakes (not sponsored) and has a buttery, melt-in-your mouth texture. These little gems are especially pretty on a holiday cookie plate or with a cup of tea on a cold afternoon. My oldest daughter thought it would be fun to share a cookie each week between Thanksgiving and Christmas. I loved the idea but then I realized I had to stop watching Hallmark Christmas movies and get baking! I’ve actually become quite good at watching Hallmark while cooking but baking requires a tad more concentration. So don’t look too closely – there might be a few cookies that are sportin’ a tan. 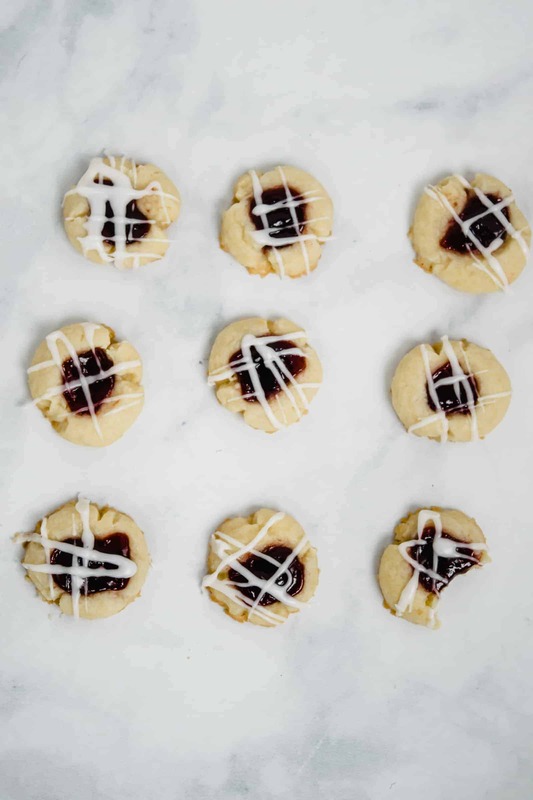 To kickoff the Cookie Series, I knew these Raspberry Almond Thumbprints were the perfect candidate. Colorful, light with a tender crumb and a burst of raspberry jam. And the almond glaze? YUM. The best thing about these cookies is they are made in one bowl. Sure, they take a little time in the fridge to hang out but then that’s the perfect time for you to watch part of a Christmas movie (you know where). 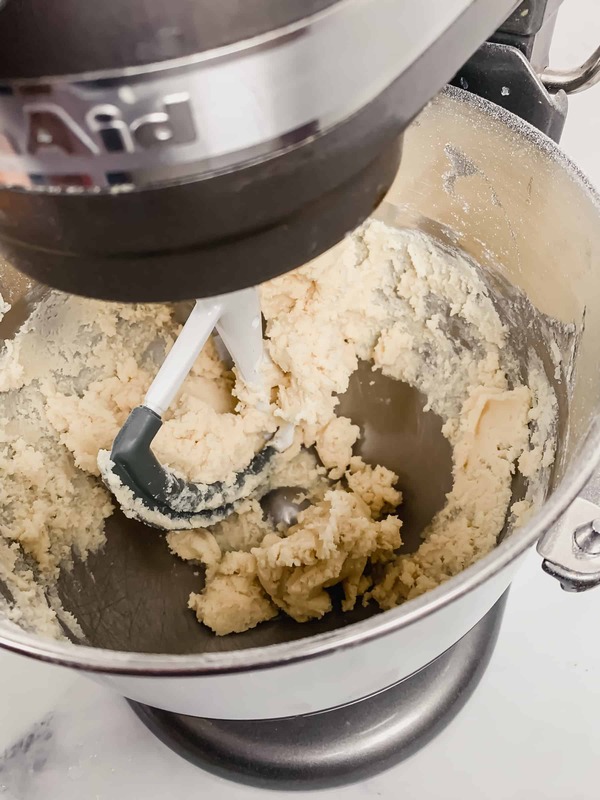 Back to the recipe – start by creaming the butter, sugar and almond extract together in a mixer until fluffy. It’ll change color and lighten up but don’t worry if it kind of smooshes up a bit on the side of the mixer. Just stop the mixer and scrape down the sides. Next, add the flour and the salt while the mixer is on low. The ingredients will slowly come together and it should look like this (guessing your bowl will be neater than mine.) Scrape down the sides, cover the dough with plastic wrap and refrigerate for at least an hour. You can even let it sit overnight if you want. The dough will be stiffer but it’ll soften as you roll the cookies. 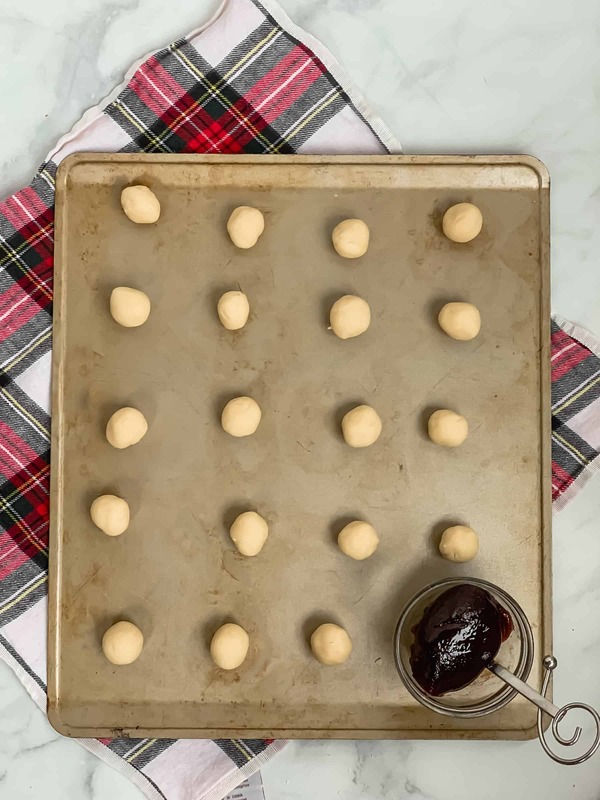 After at least an hour has passed, remove the dough from the fridge and roll out 1″ balls on to a cookie sheet. FYI – you can put down parchment paper. But please do not use any cooking spray with this recipe. It’ll cause the cookies to spread and lose their shape – no bueno. Now the fun part – take your clean thumb and gently press in the center of each cookie ball. The cookies might crack on the edge – it’s ok. Just smoosh them back together a bit. They’ll be beautiful when they’re done – I promise! Just don’t press too hard so that you go through to the cookie sheet. Once the whole tray is thumb printed, get a small spoon – I have found little baby cereal spoons work best. Somebody in my house decided we didn’t need them anymore and got rid of ours, but I digress. Take that small spoon and spoon about 1/2 teaspoon of jam into the center of each thumbprint. After you finish loading those babies up with jam, it’s time for the oven. Bake them for about 9 minutes – keep an eye on them – once the edges start to lightly brown, take them out. Let them cool for a few minutes before removing to a rack. While the cookies are baking, mix up the glaze to a drizzle consistency. You can do whatever pattern you like – I prefer a crosshatch design but have at it. It’s your cookie. Tuck a piece of parchment under your rack to save a mess on the counter. 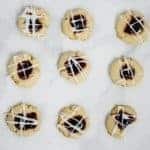 Try to resist a bite – or if you’re like me – look for a few sad looking cookies that won’t make the cut (I spy a few here and there). If your house is like mine, you might have to make them a couple of times this holiday season! Happy baking! A buttery, melt-in-your mouth shortbread cookie that's perfect with tea on a snowy afternoon. Adapted from Land O Lakes. Preheat oven to 350° Prepare a cookie sheet with parchment paper or a light pass swipe of butter. Do not use cooking spray. 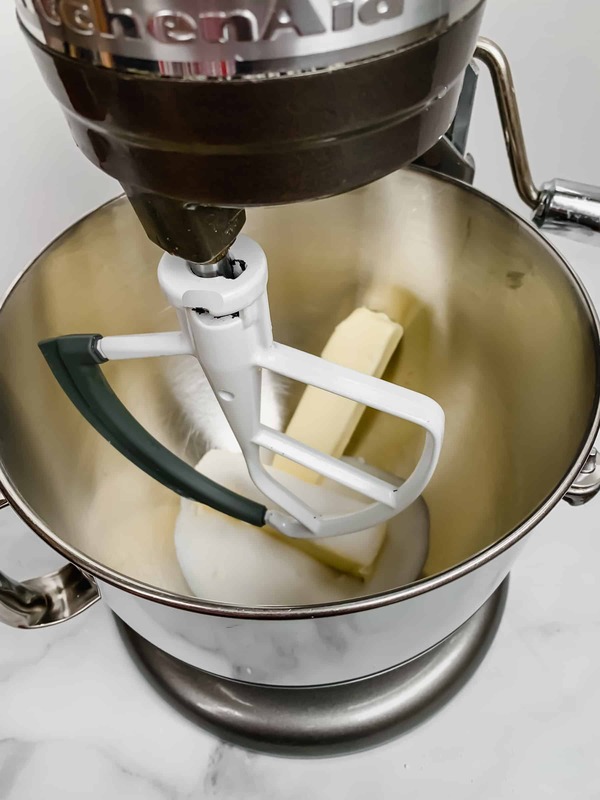 Cream butter and sugar together in a mixer at medium until fluffy about 2 minutes. Scrape down sides of mixing bowl. .
Scrape down sides again and cover bowl with plastic. 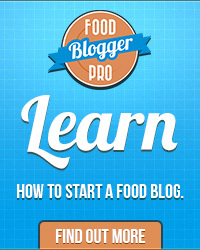 Refrigerate for at least an hour and up to 24 hours. Dough be frozen at this point. After time has passed, remove cookies from fridge and begin rolling dough into 1" balls. Place on cookie sheet about 4 cookies across. 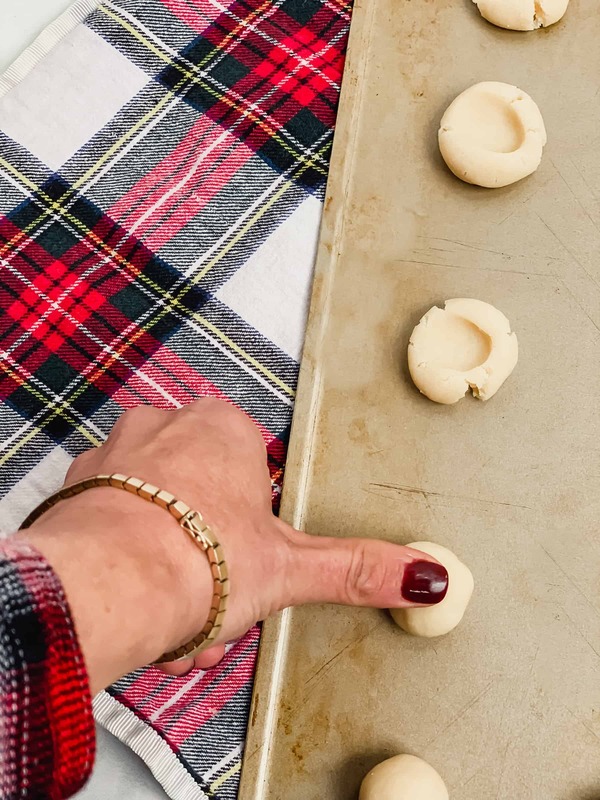 Using thumb, gently make an indentation into the center of the cookie being careful not to go all the way through to the cookie sheet. 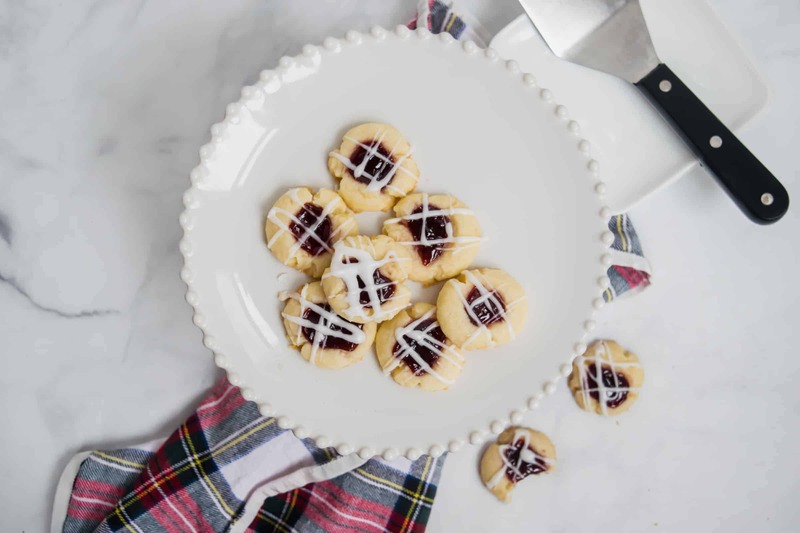 Fill cookies with approximately 1/4-1/2 tsp of raspberry jam. Bake for 8-9 minutes keeping a close eye on the edges. You want the cookie to be light on top. While cookies are baking, mix powdered sugar and almond extract in a small bowl with a fork. Add water as needed to get a smooth, drizzling consistency. Remove cookies from oven and let rest for a couple of minutes and remove to a wire rack until cool. 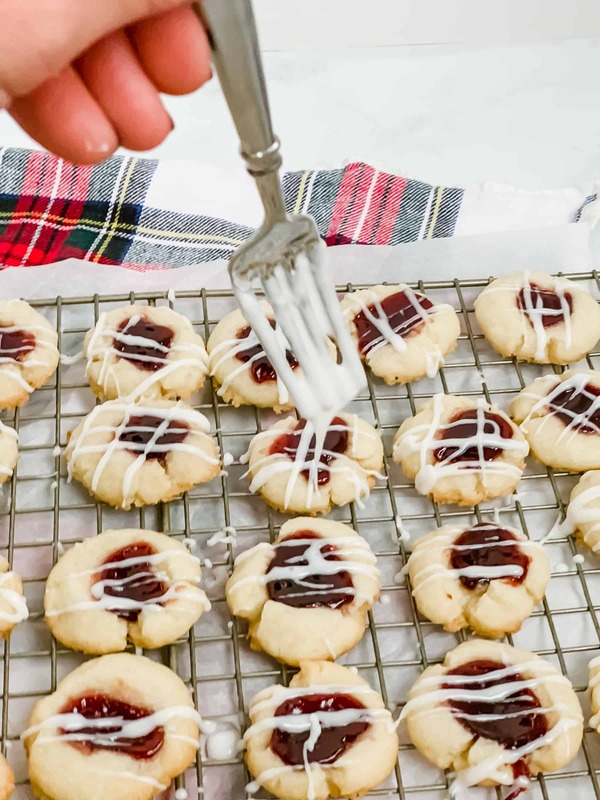 Drizzle glaze over cookies with a fork in desired pattern. Do not use baking spray on the cookie sheet with these cookies. Parchment paper is best if you need to use anything. Use any flavor of jam you like as long as its seedless. Cookies can be frozen once jam has set. 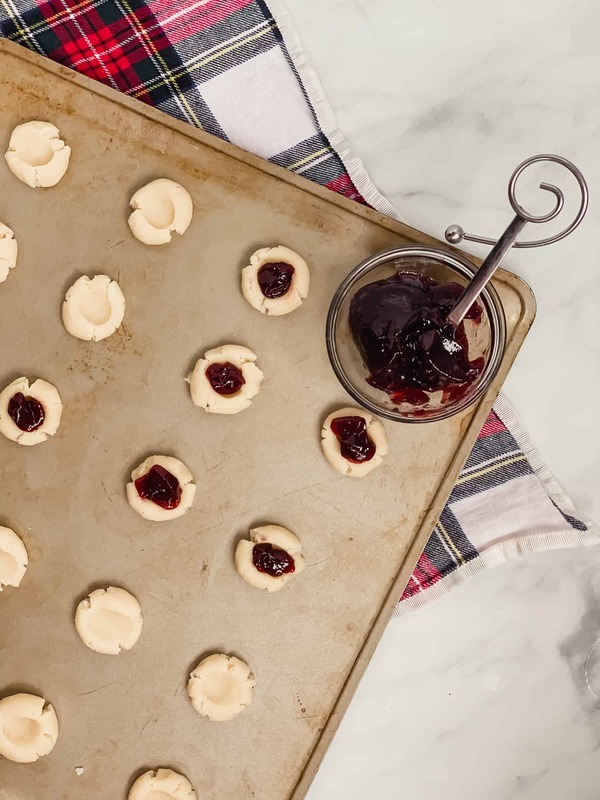 Parchment paper or wax paper is best for protecting the jam when layering. Lori, I’ve made these cookies and they are one of my favorites. Not sure if it was the exact recipe but, I got them in a cookie exchange a long time ago and didn’t share them with anyone. We had a few Christmas sprinkles on them for a little extra. ( that’s how we role, haha!) I’d like some right now. Thanks for reminder. Can’t wait to bake. You’ve inspired me, I may even invite grandma ….Georgiann! Thank you Jenny! Making the holiday baking a family affair is way more fun which I know you already know! Hi Tracey!! Thank you! So glad you liked them. They are so good. I have definitely frozen them. Be careful to put wax paper or parchment between them after they have set up or you’ll have a mess. One thing I just thought of also is to leave the glaze for once they thaw if you want. Although I haven’t had a problem doing it. The real test is getting them to the freezer before they disappear! Thanks for the recipe love!